Frank Bruni, the former New York Times restaurant critic, has clear memories of his favorite dessert as a six-year-old. He describes it in his memoir, Born Round: “As the chocolate melted in a saucepan in the galley kitchen, it perfumed the entire first floor of our Cape Cod in northern White Plains. Mom made chocolate sauce every Sunday night, as a special weekend treat, and Mark and Harry and I got to eat our bowls of ice cream (three scoops each) in front of the TV while watching Mutual of Omaha's Wild Kingdom. Sundays were for sundaes and lion kills in the Serengeti." 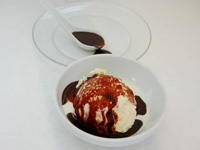 When he was young, Bruni always ate this impossibly chocolaty sauce with vanilla ice cream; as he got older, he’d take advantage of the multiple flavors in the freezer. “I’d put it over chocolate: something about chocolate over chocolate showed extra emphatic decadence,” he said in an interview. “I was always pushing the decadence boundary.” Bruni shares the recipe exclusively with Food & Wine here.